The 19-year-old accused of killing 17 students and teachers in Florida last month was observed "smiling and giggling" on multiple occasions during his time behind bars, according to jail records. Deputies said Nikolas Cruz "appeared to break out in laughter" while in custody Feb. 20, just six days after the massacre at Marjory Stoneman Douglas High School in Parkland, according to observation reports obtained by ABC affiliate WFTS on Wednesday. He was also "observed smiling and giggling" on Feb. 23 while speaking to with his attorneys, according to corrections officers who monitored Cruz's behavior. Additional observation reports indicated that Cruz was "cooperative" in his interactions with officers, while other reports said he appeared "restless" and in "deep thought" at times. The observations, taken from Feb. 17-24, offered a rare glimpse into the suspect's life in protective custody at the Broward County Jail in Fort Lauderdale. Some details of his detainment were redacted in the report, which WFTS obtained via a public-records request. "They are snippets observations from corrections officers and are not clinical impressions made by his treating psychologist or psychiatrist at the jail," Gordon Weekes, the suspect's public defender, said in a statement obtained Tuesday by CNN. "They don't show a complete picture. They are generated because Mr. Cruz has a high-profile case and is on suicide watch." 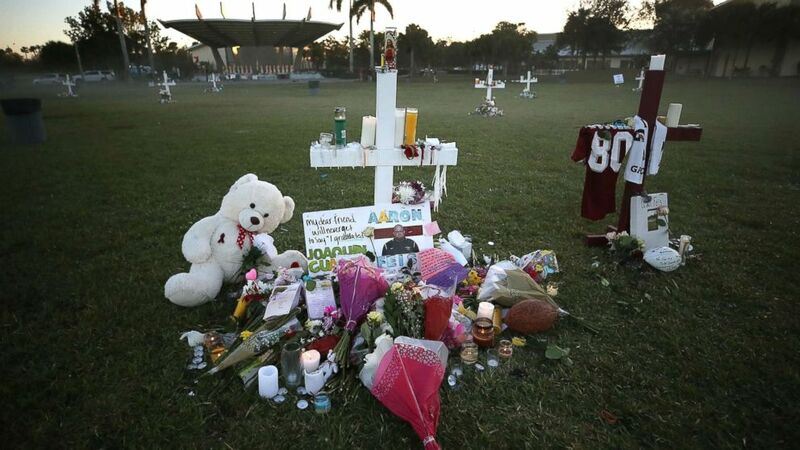 (Mark Wilson/Getty Images) Flowers and mementos are placed on a memorial site, Feb. 17, 2018, for those killed mass shooting at Marjory Stoneman Douglas High School, in Parkland, Fla.
Cruz is charged with 17 counts of murder, but authorities have yet to release details on why the former Marjory Stoneman student allegedly stormed into the school with an AR-15 and opened fire.